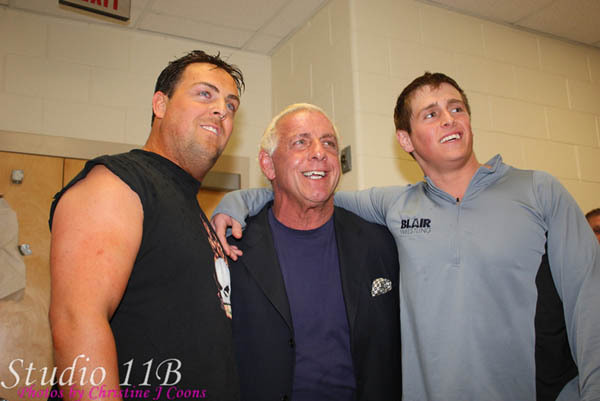 On Saturday Dec. 6th at Vance High School in Charlotte, N.C. Reid Flair made his professional wrestling Debut in a Tag Team Match teaming up with his brother David when they faced the Nasty Boys. In Reid and David's corner was their father Ric and in the Nasty Boys corner was The "Mouth of the South" Jimmy Hart, the special referee was surprisingly Hulk Hogan. The pics below are from this very historic night and before you check the pics out I have several comments to make, one is about Hulk Hogan's presence in the match as special referee, I don't think I have to go over everything Hogan has done politically behind the scenes to make himself look good and to hold people down and I also don't think I have to tell anyone out there about how massive Hogan's ego is and how he and Eric Bischoff intentionally tried to sabatoge and hurt Ric Flair's career in the mid to late 90's in WCW, there is no doubt about any of them facts but this is not the time or place to discuss that. 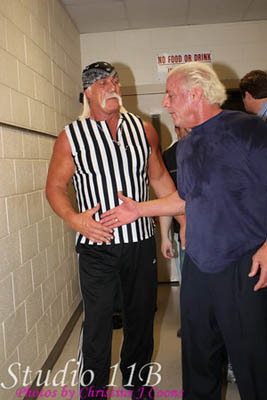 For one of the only times in his life I think Hogan didn't have a alterior motive when he made the trip to Charlotte to be the special referee and I am very thankful for that. I honestly think that Hogan simply wanted to hang out with the guys and just have some fun, it is about time Hogan started doing things like this, I wish he would do it more often, so even though I will never forget what Hogan has done politically to screw people over I can say I appreciate what he done in Vance High School in Charlotte on the night of Saturday, Dec. 6th. Let me make this point real clear though, the focal point of the night was not Ric Flair or Hulk Hogan, it was about the Professional wrestling Debut of Reid Flair and the beginning of what I hope is a magnificent career. Ric Flair with Hulk Hogan and Ricky Steamboat Jr. Here I am with Ric's Former Wife Beth, Daughters Ashley and Megan and Reid's Girlfriend, All of them were very sweet and kind.